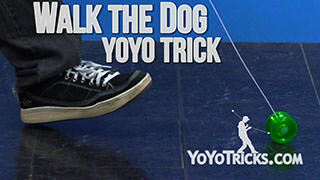 Learn how to perform the popular yoyo trick Walk the Dog, plus variations Walk the Cat (Naughty Dog), Creeper, Walk the Dog Around the Park, and Walk the Dog with a Twist. As you can see, conceptually, Walk the Dog is a pretty simple trick. All that you are going to do is throw a powerful sleeper and because the yoyo is spinning when it touches the ground, it starts to move. So you are going to use that motion to perform the trick. Now, when you start to work on this trick, it might not work as well as you would like, so I am going to give you a couple of tips to help make the trick work even better. The first thing is, when you start doing Walk the Dog, the first time that you do it, if you just set the yoyo right down onto the ground, it is not going to move forward very much. The reason it is not moving forward is you really need to give it a little bit of momentum so that it can really take off. So what you want to do is when you throw the yoyo, you are going to want to swing it behind you a little bit, and then swing it forward as you touch it to the ground. Watch what a difference that makes. Because the yoyo already has some speed on it, it is able to get ahead of you and then you can walk behind it. Now, the second thing that you want to keep in mind is, you do not want to get your yoyo hand too close to the yoyo, or else the yoyo will come back. The reason for that makes sense, the yoyo is spinning really quickly and so if you get your hand too close to the yoyo, that will put some slack in the string, but so the yoyo is spinning fast, it wants to eat that slack up. So it will naturally come back. So you want to make sure that as you do the trick, you do not get your hand too close, because that will happen. You want it to walk out in front of you and lead you and that way you can keep the same distance from your hand and the yoyo at all times. That will keep that from happening. 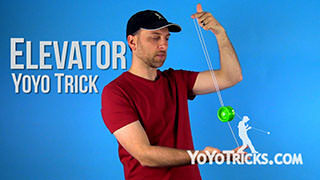 Now, when you want to bring the yoyo back to your hand, there is two ways to do it. The first way is you could just pull the yoyo up to bring it back. Or you can do what I just showed you, you could intentionally move your hand toward the yoyo, and you can see that that works just as well. Now, once you have mastered the basics of Walk the Dog, like I said, there is a couple of variations you can try. 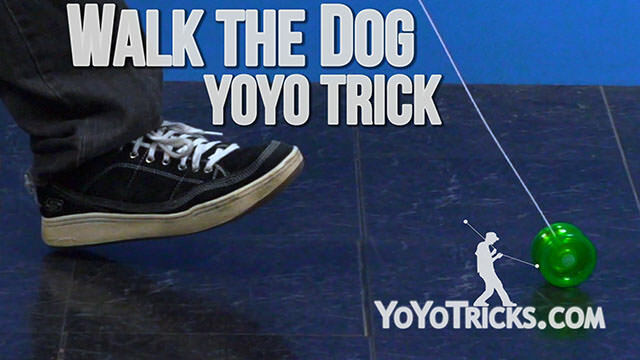 The first one, some people call “Walk the Cat,” I guess you could also call it the “Naughty Dog.” What you are going to do is take the yoyo and instead of holding it the proper way, you are actually going to turn it around so that you are holding it backwards. Now if your throw is straight, you should still be able to get a decent sleeper, but now the yoyo will be spinning in the opposite direction. If the yoyo is spinning in the opposite direction, you can actually swing it the other way, and then you have just walked the cat, because they do not listen when you walk them. The second thing that you can do with Walk the Dog is what is called the Creeper. This is where you are going to walk the dog all the way out in front of you and then pull it back after you have knelt down to the ground. 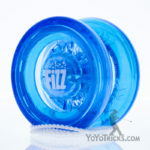 The yoyo will come back to you, sliding along the ground. So that looks like this. Again, that is a pretty straightforward variation. As long as you let the yoyo get far away from you when you kneel down, just give it a little pull, it will come right back. Once you have mastered the creeper, you can move on to the next variation. We call this, “Walk the Dog Around the Park.” This one is a little bit more tricky, let me show you what it looks like. So for this one, it starts off just like a normal Walk the Dog, where you are going to walk the yoyo in front of you. 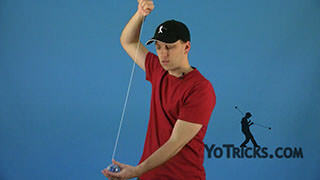 But then you are going to have to pull on the string really slightly to change the direction of the yoyo. 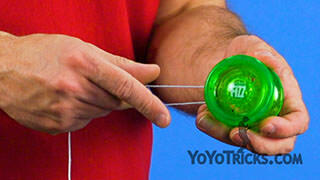 Again, if you pull on it too much, the yoyo will come back. 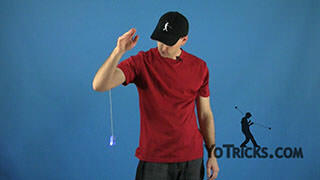 So you are really just nudging the yoyo back in the opposite direction. 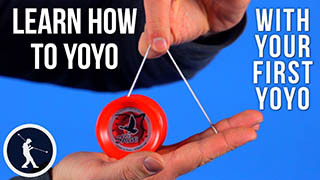 If you kind of gradually accelerate the yoyo in the opposite direction, you will be able to get it to move actually in completely the reverse direction. Then once it is all the way behind you, then you can use the spin of the yoyo and again pull it in pretty much the same way. That will get the dog to walk the way that it was in the beginning. That way, you can complete the trick. Now, the last variation, we call “Walk the Dog with a Twist.” This one, we combine Walk the Dog Around the Park, as well as the Creeper. But, as you will see, the trick does end with a twist, that looks like this. As you could see with that trick, when the yoyo gets to the end of the string and it comes back, the string starts to spiral around the side of the yoyo. The reason that that happens is, when you walk the dog around the park, the yoyo naturally changes its orientation. 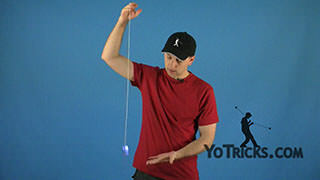 If you can get it to change its orientation so that it is perfectly perpendicular to you, when you go down to do the creeper, then the string will naturally start to sidewinder around the yoyo the way that you have seen. You do not actually have to walk the dog all the way around the park, you could just do a normal walk the dog and if you do it long enough, the yoyo will naturally turn and again, same thing, once it is perpendicular to you, just kneel down, put your hand to the ground. Sometimes you have to give the yoyo a little bit of a pull, but you will see it start to sidewinder until it comes all the way back to your hand. So, that is the trick Walk the Dog, that one is pretty straightforward but some of these variations can be a little bit tricky but they are also a lot more fun. So that is Walk the Dog and a couple of variations.